The globalisation of real estate will accelerate from 2018, with more than 30 per cent of transactions likely to be cross-border, according to global real estate advisor Knight Frank in its inaugural Active Capital report, which examines capital flows into the world’s Super Cities1 and to what degree the markets are driven by overseas capital. New York attracted the most overseas capital in 2016, US$16.3 billion, but remained largely driven by domestic buyers, who accounted for 60 per cent of total investment. London is ranked second in terms of overseas in investment, and the US$15.9 billion of foreign capital represented 80% of total volumes, making it the Super City most driven by overseas capital. Elsewhere in Europe, Paris and Berlin attracted overseas capital totalling US$9.7 billion and US$6.8 billion respectively. In Berlin, this constituted 69% of total investment activity, whereas in Paris domestic buyers are more active, accounting for 61% of total transactions. 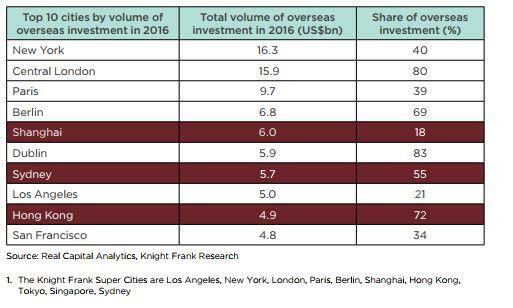 In Asia Pacific, Shanghai, Sydney and Hong Kong also made it to the top 10 list of global cities attracting inbound capital from overseas investors. Knight Frank analyses the sources of cross-border capital, highlighting the varying attitudes of investors across different geographical regions. According to RCA data, the rise of Asian investors as capital exporters has been clear trend; the data shows a 244% increase in Asian cross-border capital over the last ten years – the largest regional growth globally. Asian overseas investments amounted for US$67 billion in 2016, versus US$19 billion in 2007, which is recognised as the peak of the previous real estate cycle. Nicholas Holt, Asia Pacific Head of Research at Knight Frank, says, “While significant amounts of capital have been heading out of the region, we expect more intra-regional flows in the coming years as core Asian markets become deeper and more liquid – spurred by increased transparency and relative political stability. As the weight of Asian capital looking for real estate continues to grow, we also envisage that more secondary or emerging markets will begin to be targeted by the more opportunistic groups. European investors, meanwhile, have not returned to the levels of overseas investment seen pre Global Financial Crisis. 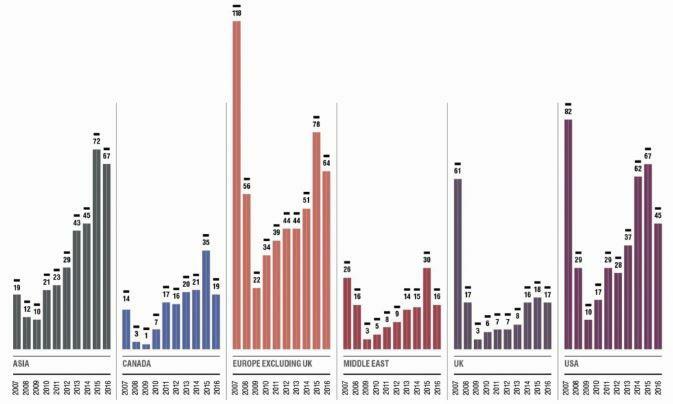 In 2007, European investors placed US$118 billion overseas, which plummeted to a low of US$22 billion in 2009, before recovering to US$78 billion in 2015, and US$64 billion last year. Similarly, UK investors are placing less capital overseas, accounting for US$16 billion over overseas investment in 2016 versus a 2007 high of US$61 billion. As a new global economic cycle begins, active capital flows are likely to change direction and emphasis. Emerging markets are likely to attract more interest as mature locations see performance moderating and opportunities becoming harder to find. Also, investors who have been attracted to developed economies by the positive currency arbitrage or due to weak performance in their own markets are more likely to explore opportunities closer to home as domestic conditions improve and foreign exchange movements work against them. Nonetheless, whilst the weight of capital will shift depending on domestic markets and economic conditions, there will be other investors with the ability and the appetite to focus on the Super Cities. Whatever the economic conditions, the Super Cities and other gateway locations will continue to attract significant capital. James Buckley, Executive Director Capital Markets at Knight Frank Malaysia, says “since 2014, Malaysia has attracted overseas capital totalling US$2.6 billion with Singapore accounting for 43%, followed by Australia at 19% and China at 17%. The volume of overseas investors investing in Malaysia has dropped significantly since 2016 and although the market fundamentals are healthy, they are being somewhat overshadowed by the domestic political situation. I expect the level of uncertainty to fall and sentiment to improve once the general election takes place. On a regional basis, Malaysian property offers incredible value. DISCLAIMER: The data above represents the findings of Knight Frank Research and is not in any form and endorsement or recommendation by iProperty.com. Readers are encouraged to seek independent advice prior to making any investments.